2nd field > x : This one represents the encrypted password which is stored in /etc/shadow file. PS: UID 0(zero) is reserved for “root” , 1-99 are for pre-defined accounts , 100-999 are reserved by system for several purposes. 4th field > 1008 : ID of primary group that the user belongs to. The group information is stored in /etc/group file. 5th field > this field has not set yet: This is comment field that can be used for user’s full name etc. A sample view is shown below. 6th field > /home/baris : The home directory of the user. 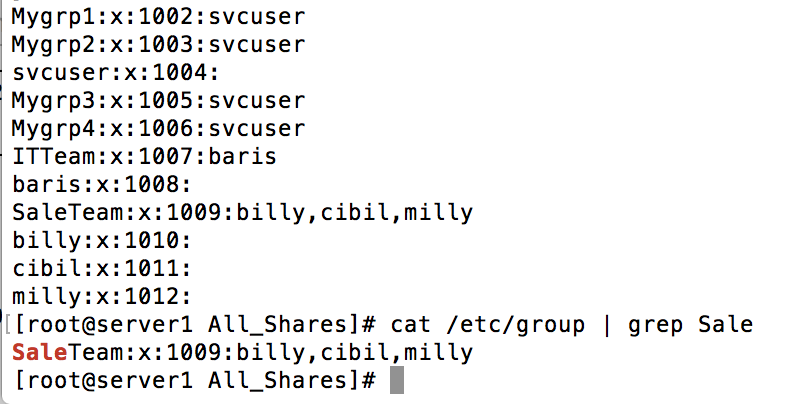 7th field > /bin/bash : User’s login shell. If this field is not set explicitly, the parameters which are defined in /etc/default/useradd file are used when creating user account. /etc/group file stores group information like below. 1st field > SaleTeam : The name of the field. 3rd field > 1009 : Unique ID like user objects have. 4th field > billy,cibil,milly : Members of the group. To make it short I’ll give a break.